Switching the Audio Mode Press the SOURCE button on the steering wheel. You can also switch the mode by pressing and selecting Change Source on the Audio menu screen. You can store 6 AM stations and 12 FM stations into the preset memory. Provides text data information related to your selected RDS-capable FM station. 1. 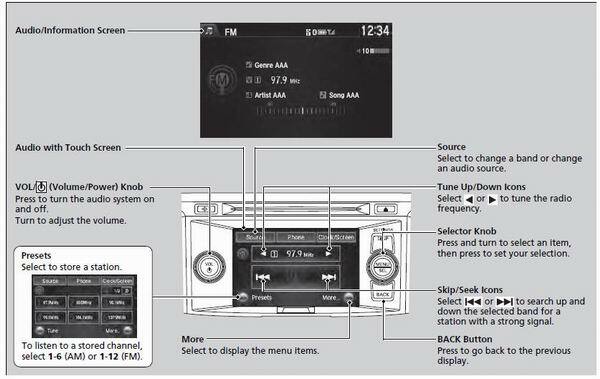 Press to switch to the Audio menu screen while listening to an FM station. 2. Rotate to select Station List, then press . 3. Rotate to select the station, then press . Updates your available station list at any time. 3. Rotate to select UPDATE LIST, then press . When you select an RDS-capable FM station, the RDS automatically turns on, and the frequency display changes to the station name. However, when the signals of that station become weak, the display changes from the station name to the frequency. Displays the radio text information of the selected RDS station. 2. Rotate to select Radio Text, then press . Samples each of the strongest stations on the selected band for 10 seconds. 2. Rotate to select Scan, then press . To turn off scan, press to select Cancel Scan, or press the BACK button. To turn off scan, select Cancel Scan. The text indicator comes on when you received a text message. The indicator stays on until you read the message.